Arizona Department of Transportation sent this bulletin at 08/16/2017 01:32 PM MST. If you would like alerts on this and other ADOT news, sign up above to receive our GovDelivery notices. PHOENIX – The first traffic restrictions required for the installation of a first-in-the-nation pilot wrong-way vehicle detection and warning system are scheduled this weekend at the Interstate 17 interchange at Indian School Road in Phoenix. Preliminary work started in the past week on the Arizona Department of Transportation’s $3.7 million thermal-camera based project designed to immediately alert ADOT and the Department of Public Safety if a wrong-way vehicle is detected along a 15-mile stretch of I-17. Indian School Road will be closed in both directions at I-17 from 9 p.m. Friday to noon Saturday (Aug. 19) for the mounting of thermal cameras, installation of fiber-optic cable and rewiring of control cabinets in the area. Both I-17 off-ramps at Indian School Road will be closed. Drivers should consider alternate routes, including Camelback or Thomas roads. Indian School Road traffic approaching I-17 will be required to make right turns onto the freeway’s frontage road or on-ramps. 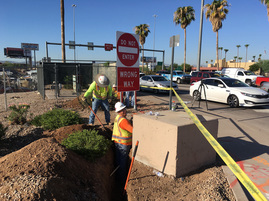 Future restrictions will be scheduled at other I-17 interchanges between I-10 northwest of downtown and Loop 101 in north Phoenix as the installation project advances over the next few months. No restrictions will be scheduled over the Labor Day holiday weekend. Following installation and testing, the system will be fully operational by early next year. Work on the I-17 wrong-way vehicle alert system started a month sooner than estimated because ADOT pre-ordered some of the materials, including thermal cameras and fiber-optic cable, earlier this summer rather than wait for a contractor to purchase those items. The system also will immediately alert ADOT and DPS that a wrong-way vehicle is detected while warning other freeway drivers in the area through overhead message boards. On the freeway, additional cameras will signal when a wrong-way vehicle passes to help State Troopers plan their response. That response right now usually begins with 911 calls from other motorists. The I-17 pilot system will speed notification, but it can’t prevent wrong-way driving, which in most cases involves impaired drivers. ADOT and its partner agencies, including DPS and the Governor’s Office of Highway Safety, continue to study other potential countermeasures to reduce the risk from wrong-way driving.